The Department of Ecosystem Studies aims to develop sustainable global management schemes that value ecosystem mechanisms and allow human society and nature to live in harmony. 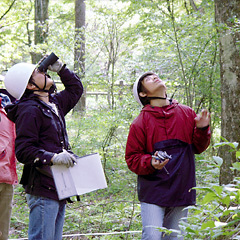 An important feature of this department is a focus on fieldwork, which is conducted in different ecosystems, located in forest through to coastal environments. Based on an understanding of the mechanisms and existing problems of focal ecosystems, we aim to both integrate agricultural and life science related academic achievements and develop related principles and techniques, while educating skilled personnel. The department has two main divisions, Biological Conservation and Ecosystem Management, and two associated divisions of Bioresources Management and Bioresources and Eco-Environmental Studies. The Bioresources Management division cooperates with the former two divisions in research and education, and is composed of six establishments within Graduate School of Agricultural and Life Sciences. Biodiversity Science Studies on various aspects of biological diversity, both from pure and applied views. Conservation Ecology Ecological studies for conservation and restoration of biodiversity and integrated ecosystems. Evolutionary and ecophysiological studies on plant life histories including vegetative responses to physical environments and floral and seed strategies such as heterostyly and soil seed banks. Landscape Ecology and Planning Landscape ecological studies on global and regional environment, monitoring on natural environmental changes caused by human impacts, ecological land evaluation and its application to landscape and environmental planning. Forest Ecosystem Studies Genetic and ecological studies for conservation of forest and surrounding ecosystems. Planning sustainable use of forest resources. Analysis and conservation of tree diversity, forest species interactions, population dynamics of animals and plants, and endangered species conservation. Assessing restored and natural intertidal flats in a damaged embayed system. Production mechanisms in coastal ecosystems based on stable isotope analyses. Life cycles of coastal fishes and invertebrates. Development of strategies for coastal ecosystem conservation.